The monoamine neurotransmitter dopamine is best known for its connections with reward and motivation. However, it plays a large role in movement and learning. Dopamine levels are consistently seen to be raised by regular exercise. This is possibly mediated by neurotrophic factors, such as BDNF. BDNF’s relationship with dopamine has implications for the method of action of antidepressants as well as pharmacotherapy for Parkinson's disease. Dopamine is a catecholamine transmitter that plays a role in motivation and reward, movement, working memory, plasticity, and prefrontal cortex functioning. Two dopamine receptor subtypes include D1 and D2 receptors. D1 receptors work to ensure the stability of prefrontal cortex neural activation. It does this by filtering input, as only stimuli over a certain level of salience, or threshold, is relayed on to the prefrontal cortex. This eliminates distraction from irrelevant information and allows for focus and the attention necessary for adequate response to incoming stimuli. D2 receptor activation, however, acts to alert the prefrontal cortex to highly salient, usually reward-related information. This allows the working memory system to be updated. Dopamine levels and increase are consistently found to be increased during exercise. This is specific to areas highly innervated by dopaminergic neurons, such as the striatum. Dopamine is necessary for movement initiation, as dopamine release from the substantia nigra pars compacta is needed to activate the basal ganglia, a midbrain brain region which initiates movement. Research has shown dopaminergic activity in the primary motor cortex to be an integral part of motoric learning, as well as maintaining the plasticity of the primary motor cortex. Complete elimination of dopamine in the primary motor cortex does not completely inhibit motor skill learning however, suggesting dopamine is a neuromodulator within this context, enhancing motor skill learning. Other modulatory neurotransmitters may compensate to a degree in the case of total dopamine elimination in the primary motor cortex. Overall, it is evident dopamine plays a pivotal role in motor learning and memory formation. The blockade of dopamine through receptor antagonists applied in a horizontal slice of the primary motor cortex causes decreased long term potentiation, which is believed to be the mechanism for memory formation. The use of isolated brain slices emphasizes the fact that this is not a result of extended effects, but rather direct application on only the primary motor cortex. 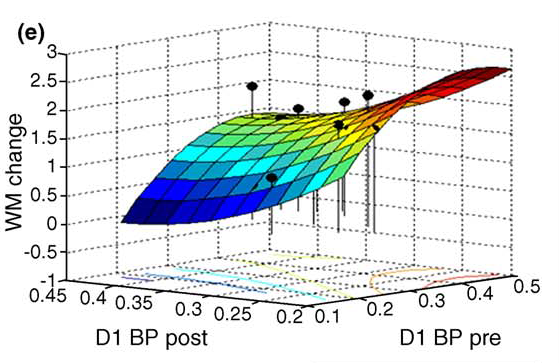 Long term potentiation in the horizontal connections of the primary motor cortex has been implicated in certain skilled task acquisitions, and may be a process through which dopamine exerts its neuromodulatory effects on the learning of motor skills. This has been replicated in the prefrontal cortex with dopamine antagonists, highlighting the importance of dopamine in learning and memory. Additionally, research has found learning speed in individuals to be associated with levels of dopamine metabolites found in their cerebrospinal fluid. Movement recovery has also been found to be enhanced by the pairing of motor skills training with levodopa administration. Current evidence concordantly shows that dopamine transmission is highly important for plasticity and learning within the primary motor cortex. Dopamine is seen to be important not only for motor skills learning, but working memory performance in general. This is evidenced in studies which show that increases in the capacity of working memory through targeted exercises are seen to be associated with changes in cortical dopamine D1 receptors. The amount of D1 receptors was seen to mainly decrease in a non-linear fashion, described as an inverted U. This is backed by other studies, which show that in certain cases, minimal amounts of D1 receptor blockade can actually improve working memory function, however large doses have the opposite effect. Fig3. Adapted from Klingberg. Changes in dopamine D1 receptor density pre and post training (working memory tasks) and increase in working memory capacity. Dopamine has a non-linear relationship with cognition. At a low baseline level, enhancing dopaminergic activity has a beneficial effect on cognition. However after a certain point, further potentiation of dopaminergic activity impedes the function of working memory. This relationship is characterized by an inverted U, the peak being an area of optimal cognitive performance, associated with a mid-level amount of dopaminergic activity. This threshold is hypothesized to be a result of the different effects dopamine binding has on D1 vs D2 receptors. Suboptimal dopaminergic effects on cognitive performance are a result of an improper ration of D1 to D2 receptor binding. Insufficient D1 activation in the prefrontal cortex is thought to create a lower activation threshold; neural networks become susceptible to interference from irrelevant stimuli, and are interrupted more easily. This translates to reduced attention, and ability to separate salient information from background noise. Impulsivity, being easily distracted, and decreased working memory functioning are all results of this imbalance, all essentially related to executive function. Inadequate D1 activity generally causes impairment in executive functioning of the prefrontal cortex. Conversely, too much activation of D1 receptors results in cognitive inflexibility. Neural networks in the prefrontal cortex are undisturbed; however this means they cannot be changed if necessary. At a behavioural level, this could result in repetitive, stereotypic actions. Another result is reduced cognitive flexibility, and impairment at tasks specifically designed for measurement of that dimension of cognition. The threshold level of dopaminergic stimulation in the prefrontal cortex required for optimal cognitive functioning varies between individuals. Another factor in this variability is the Catechol-O-methyl transferase, or COMT, gene. It codes for an enzyme which catabolizes dopamine, clearing it out of extrasynaptic spaces and thus effecting its levels within the the prefrontal cortex. It is especially associated with modulation in fronto-striatal areas. Some individuals have a polymorphism of the gene, in which the valine at position 158 is replaced with methionine. The enzyme produced is less stable, and therefore is drastically less active, achieving only about a quarter of what the val-containing enzyme would. COMT is very important for dopamine clearance in the pyramidal cells of the prefrontal cortex, as there are less dopamine transporters in this area. High levels of dopamine would be easily cleared by the val-containing COMT enzyme, reducing extrasynaptic D1 stimulation and allowing for the activation of intrasynaptic D2 receptor stimulation. This results in individuals with the val allele having a lower threshold for prefrontal cortex activation, or less stable neural networks in this area. This would translate behaviourally as reduced attentional abilities, but improved cognitive flexibility. Individuals with the val allele are more easily able to update information held in working memory at any given moment, or switch onto a different information and cognitive set.High levels of dopamine would not be easily cleared by the met-containing COMT enzyme. This would result in greater stimulation of D1 receptors, increasing prefrontal cortex network stability. Behaviourally this would implicate greater ability to maintain information, improved working memory, greater focus, and improved attentional abilities. However, it would also result in reduced cognitive flexibility, converse to val-containing individuals. Here a direct link can be seen with dopamine and learning and memory. Working memory, or perhaps, the required executive functioning are definitely effected by dopamine levels in the prefrontal cortex. Many experimental results implicate that consistent physical activity results in improved dopamine synthesis, and a decrease in inhibition of dopaminergic neurons in the substantia nigra pars compacta region compared to less active controls. Dopaminergic neurotransmission is regulated by several external factors. One of these is brain-derived neurotrophic factor, or BDNF. BDNF is highly important for the differentiation of neuronal cells, neuronal survival and migration, plasticity, synaptogenesis, and dendrite growth. It acts through tyrosine kinase receptor B (TrkB). TrkB is found in high levels along with BDNF in dopaminergic midbrain neurons. BDNF is expressed in dopaminergic cells in the ventral midbrain, substantia nigra, and ventral tegmental area. Dopamine release and dopaminergic cell survival are shown to be activated and enhanced by BDNF. Regular exercise has been shown to increase levels of BDNF and TrkB in the hippocampus and ventral tegmental area. Through this, exercise elicits processes such as the enhancement of angiogenesis, anti-inflammatory responses, the inhibition of inflammatory responses, enhanced functioning of mitochondria, and neurogenesis, specifically in the substantia nigra and striatum. Additionally, simple application of BDNF in a localized area can result in increased physical activity of rats. This is thought to be due to BDNF stimulation dopaminergic neurons. It is thought that sustained increases in BDNF levels through exercise could enhance and lengthen dopaminergic neurotransmission. Experimental evidence implies that as higher BDNF levels, specifically in the basal ganglia, would cause neuroplasticity in that region that may result in increased dopamine levels available during exercise. These results also suggest at the neuroprotection regular exercise can offer, in terms of dopaminergic systems and diseases that affect these, such as Parkinson’s disease. This is supported by the positive effects of exercise on symptoms of Parkinson’s disease, which are already acknowledged. Additionally, BDNF has been established as having beneficial effects on dopaminergic cell survival, elucidating a potential mechanism. Physical activity may neuroprotect dopaminergic neurons through the resulting increase in BDNF levels, and the effects of BDNF on the basal ganglia and dopaminergic systems. The effects of BDNF extend to the hippocampus as well, where its beneficial effects serve to improve long term potentiation, which therefore enhances memory formation. BDNF is thought to act as both as a neuroprotectant as well as a neuromodulator, as it enhances both function and survival. BDNF and dopaminergic function are clearly intertwined, however the mechanism by which remains unclear. Research shows that drugs traditionally used to increase dopamine levels for treatment of Parkinson’s disease may in fact act through BDNF mediated pathways. Many of these drugs increase BDNF levels, implying the neurotrophin is involved in the mechanisms through which they exert their beneficial effects. Certain drugs, such as rasagiline, act to increase the expression of other neurotrophic factors as well. 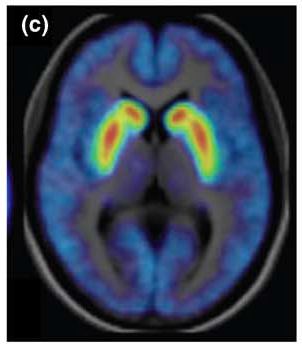 Further evidence implicating BDNF in the mechanism of action of dopamine increasing drugs can be seen with pramipexole. Antibodies against BDNF block any beneficial effects pramipexole would normally exert, which highly suggests that it acts through BDNF. This recurring pattern is a stepping stone for further research into the relationship between dopaminergic neurons and BDNF, and the potential implications of that for disease treatment and prevention. In terms of applicability, the studies referred to have largely used animal models under continuous exercise. However this is not the most realistic representation possible when it comes to people. A recent study challenged this, using intermittent voluntary activity, as opposed to continuous activity. The neuroprotective effect of exercise was still present, furthermore it was eliminated through blockade of the TrkB receptor, solidifying the role of BDNF in neuroprotective effects through exercise. This was measured neurochemically as well as behaviourally, and results were consistent. Increased levels of BDNF were found in the substantia nigra pars compacta as well. The fact that intermittent exercise still exerted neuroprotective effects is extremely encouraging, considering it’s much closer to naturalistic situations. Fig5. Adapted from Real et al.. A coronal section of the substantia nigra pars compacta in rats. Stained for tyrosine hydroxylase (TH), an enzyme important for dopamine synthesis. TH levels are indicative of health and number of existing dopaminergic neurons in the same region. The column 'EXPERIMENTAL SIDE' shows results of exposure to neurotoxin 6-OHDA. Effects are much more detrimental to sedentary rats (SED row) than the two other exercise conditions (below). 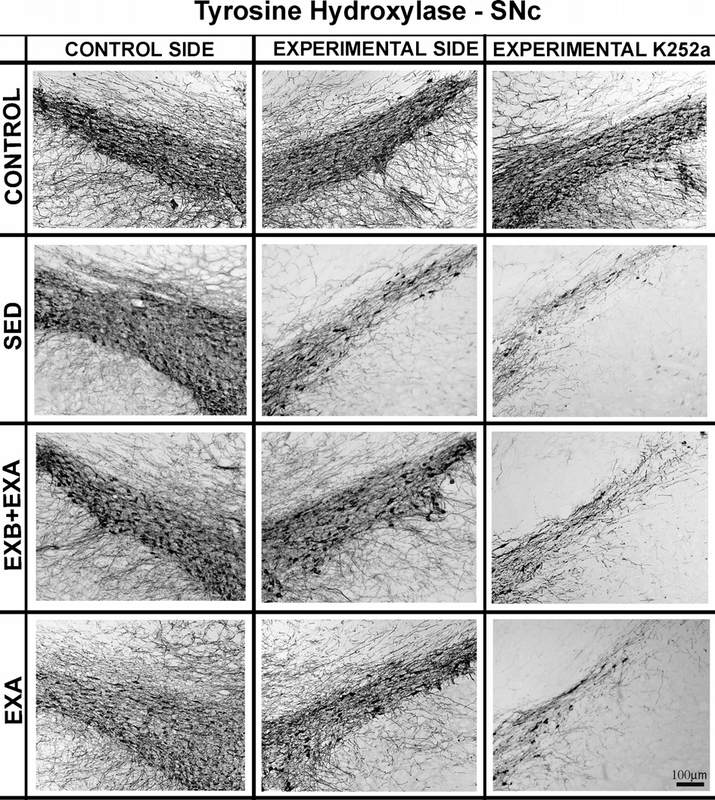 Application of TrkB receptor blocker K252a (K252a column) is seen to undo any advantage rats in the exercise condition had over the sedentary condition, suggesting BDNF is involved in neuroprotective effects of exercise. 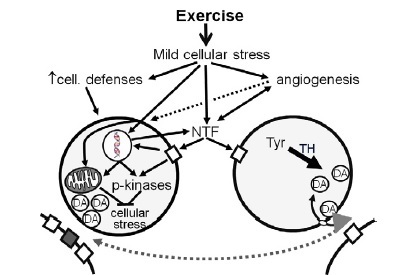 An additional mechanism proposed for the neuroprotective effects of exercise is that exercise is in fact, mildly stressful for cells. Exercising induces mild cellular stress, which is thought to result in the activation of several, intersecting events. These are thought to include an increase in neurotrophic factor levels, as well as the enhancement of defenses within the cell. Over time this would cause neurons to be sturdier and more capable of withstanding stressful factors, to a degree, as well as in the case of dopaminergic neurons, increasing neurotransmission. Fig6. Adapted from Zigmond et al.. A diagram illustrating potential effects of cellular stress of exercise. 1. Foley, T. E., Fleshner, M. Neuroplasticity of dopamine circuits after exercise: implications for central fatigue. Neuromolecular Medicine. 10, 67-80 (2008). 2. Klingberg, T. Training and plasticity of working memory. Trends in Cognitive Sciences. 14, 317-324 (2010). 3. Savitz, J., Solms, M., Ramesar, R. The molecular genetics of cognition: dopamine, COMT and BDNF. Genes, Brain and Behaviour. 5, 311-328 (2006). 4. Molina-Luna, K. et al. Dopamine in motor cortex is necessary for skill learning and synaptic plasticity. Public Library of Science. 4(9), e7082 (2009). 5. Fumagalli, F., Racagni, G., Riva, M. A. Shedding light into the role of BDNF in the pharmacotherapy of Parkinson's disease. The Pharmacogenomics Journal. 6, 95-104 (2006). 6. Real, C. C., et al. BDNF receptor blockade hinders the beneficial effects of exercise in a rat model of Parkinson’s disease. Neuroscience. 237, 118-129 (2013). 7. Zigmond, M. J. et al. Triggering endogenous neuroprotective processes through exercise in models of dopamine deficiency. Parkinsonism and Related Disorders 15S3, 242-245 (2009). I think this is really well written, and comprehensive. I liked how you put synthesized all the information! The pictures could use a little formatting (just to take away the empty borders that surround them), which you can do just by making your description multiple lines instead of just one entire long sentence. a lot of empty space! This is a really interesting neurowiki page, and I think it's a great topic because it's really relevant to everyday life. I agree with Vernie that the images can be improved by typing multiple lines in the captions. Also, some of your images seem to be in between different sections of your neurowiki and it makes it a little confusing - you can clear up overlap by using the 'clear floats' button. I really like the content of this wiki, it's so comprehensive and very well organized! Your subtopics are nicely divided as well.